BOTH IMMEDIATE & DEFERRED START AVAILABLE FOR SUCCESSFUL APPLICANTS with Interviews conducted in Brisbane, Sydney and Melbourne. Infrastructure Management Group is a civil engineering consultancy specialising in the inspection and assessment of road corridor infrastructure for governments throughout Australia. We provide these services to authorities in most capital cities and over 100 regional locations throughout Australia. We are looking for technically minded people with an organized demeanour and desire to travel and explore new places. Your duties will predominately include the piloting and operation of highly sophisticated road monitoring vehicles or the operation of similarly equipped All-Terrain Vehicle. This is a unique opportunity to work within a small team of two to four people. You will work as a local in a variety of locations around Australia from Northern Coastal tropics to major Capital Cities or the rural hospitality in Regional townships. Airfares and other transportation costs between different projects and a comfortable standard of accommodation for projects outside capital cities are provided by IMG in order to allow you to work effectively. 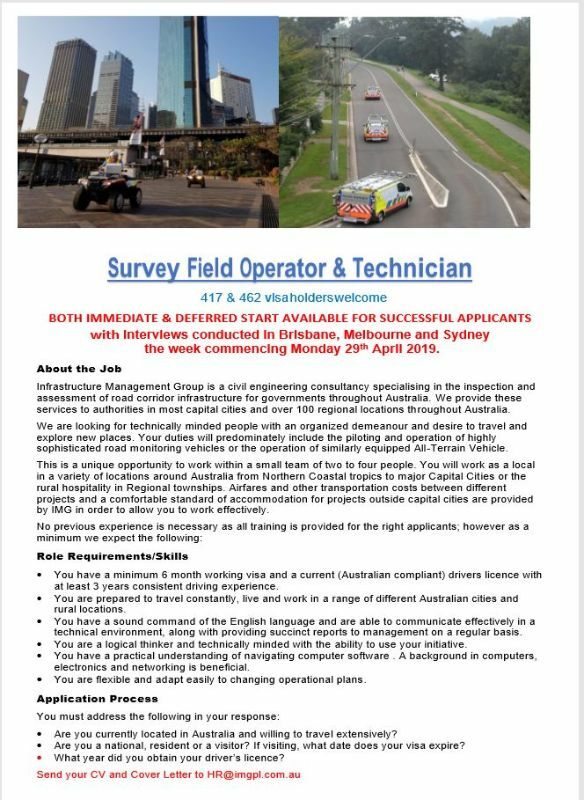 • You have a minimum 6 month working visa and a current (Australian compliant) drivers licence with at least 3 years consistent driving experience. • You are prepared to travel constantly, live and work in a range of different Australian cities and rural locations. • You have a sound command of the English language and are able to communicate effectively in a technical environment, along with providing succinct reports to management on a regular basis. • You are a logical thinker and technically minded with the ability to use your initiative. • You have a practical understanding of navigating computer software . A background in computers, electronics and networking is beneficial. • You are flexible and adapt easily to changing operational plans. • Are you currently located in Australia and willing to travel extensively? • Are you a national, resident or a visitor? If visiting, what date does your visa expire? • What year did you obtain your driver’s licence? We are a civil engineering consultancy specializing in the inspection and assessment of road corridor infrastructure for governments throughout Australia.